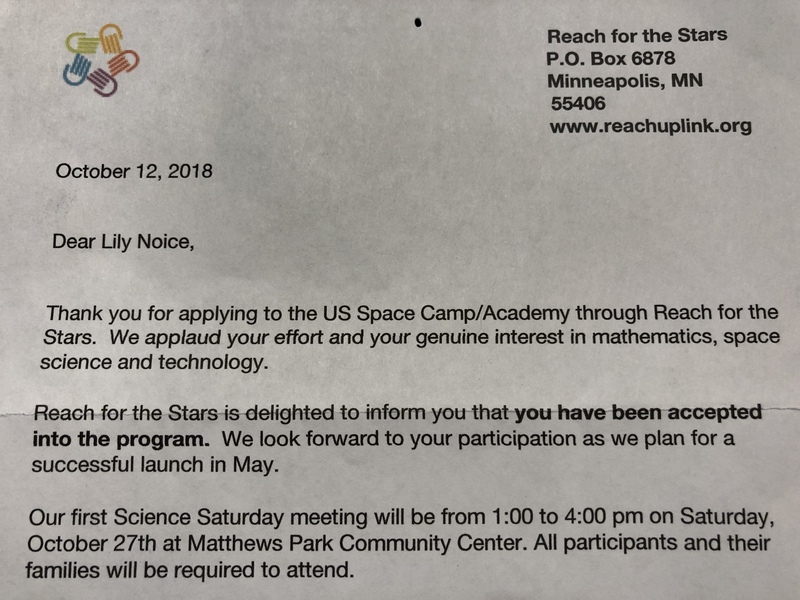 Lily applied for and was accepted into Reach for the Stars Space Camp! She and her friend, Zoe, are part of a group of 32 kids from Minneapolis and St. Paul. You can read more about the programs here. Select “Program” at the top for an overview and select “Content” and expand the Science Saturday and Space Camp tiles to see more – Lily is doing both! We’re helping to raise funds so that all 32 kids can complete this 6 month program that culminates in a six-day trip to the U.S. Space & Rocket Center in Huntsville, Alabama. Space Camp (grades 4-6) students train for and perform simulated space missions! Please check out the Reach For the Stars Give To The Max page here. Give to the Max Day is 11/15/2018! Also, if you’d like a token of our appreciation for donating, please check out the crafts here and here and here and let us know if you’d like one! Here’s a pic of Lily and the rest of her crew! And (since we’re proud of it) you can see the acceptance letter here.